Multiple Sclerosis is a disease in which your immune system attacks the protective sheath called myelin that covers your nerve cells in the brain and spinal cord. The damage to these cells are irreversible and slowly destroys the connection of the brain to the rest of your body. Damage to the myelin sheath causes permanent neurological damage. Symptoms include: tingling in the hands, muscle spasms, difficulty in moving, problems with speech or swallowing. Therapy requires injections of interferon beta which reduces the inflammation caused by MS and allows the white blood cells to cross the blood brain barrier reducing lesions in the brain. An MRI that shows several plaques (lesions) in the brain represents the advanced stage of the disease. The disease affects women disproportionately, it’s twice as common in woman ages 20-50 than men. Research suggest that woman have a higher genetic variation that causes the increase production of interferon gamma, interferon gamma aggravates MS by promoting tissue damage and inflammation. Another study in Italy found that testosterone may be protective which is a reason why men develop the disease later in life. 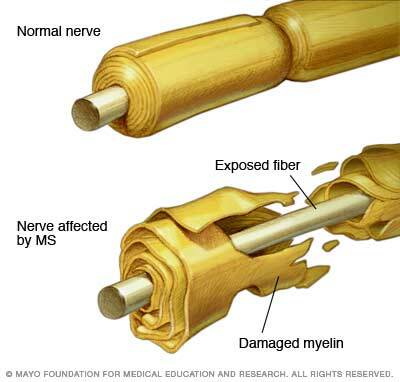 Although woman have a higher a rate of developing the disease, men MS attacks are more severe and progressive. The direct cause of MS is unknown but studies suggest that it is a combination of genetic vulnerability and environmental triggers. Environmental triggers such as cigarette smoke, Epstein Barr virus and excessive drinking may cause the disease to develop. Individuals with a family history of MS are 20 times more likely to develop the disease, but genetics is only one part of the picture; 80 percent of people with MS do not have a family history. If you have relatives with the disease or if you are currently diagnosed with MS, it is a not a death sentence. Lifestyle choices can make a difference in the quality of life, genetically vulnerable individuals should avoid cigarettes and commit to exercise and healthy food choices. Diagnosed patients should continue aggressive therapy after an MS attack, the interferons can replenish the myelin sheath cells to prevent further neurological damage. Currently there are several thousand research labs conducting experiments and a simple blood test will be used for detection instead of an MRI that usually shows neurological damage. I dedicate this blog to the memory Bria Hargrove a young woman who was a fighter all the way, hopefully these words will inform and educate people about the disease.